This deck of playing cards has pictures and information on them about the gaming industry's people, games, events and companies. 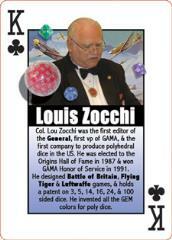 The four kings are Lou Zocchi, Duke Seifried, John Hill, and Tom Shaw. If you know who these guys are, you want a deck to commemorate them. If you don't know who they are, you need a deck so you can read about them!